In the year 1999, the complainant (appellant before the Apex Court) booked a flat at Khargar Project proposed to be developed by M/s. Salvi Infrastructure Pvt. Ltd. through the accused-respondent by paying him Rs.74,200/-. In acknowledgment of the said amount, the accused respondent issued two receipts to the appellant, for a sum of Rs.59,000/- and Rs.14,200/-, respectively. By the year 2003, as alleged by the appellant, the aforesaid project of the respondent did not materialize. After much persuasion, the accused respondent drew cheque No.075073 for Rs.74,200/- in favour of the appellant, of an account maintained by him with his banker towards refund of the aforesaid booking amount. The cheque was drawn by the respondent in his individual capacity and not in the capacity as a Director of M/s. Salvi Infrastructure Pvt. Ltd. or as Proprietor of Salvi Builders and Developers. When the appellant presented the said cheque on 1.08.2003 to his Bank for realization, the same was returned unpaid. Hence, the appellant sent notice of demand dated 25.8.2003 through his advocate under Section 138(b) of the Negotiable Instruments Act, 1881 (hereinafter referred to as “the NI Act”), to the respondent. As the accused respondent failed to pay the amount within 15 days of the notice of demand, the appellant filed a complaint under Section 138 of the N.I. Act. The aforesaid complaint filed by the appellant was taken up by the Metropolitan Magistrate, 33rd Court, Ballard Pier, Mumbai, and vide his order dated 15.12.2005 passed in C.C. No.5194/2003, the Metropolitan Magistrate acquitted the respondent on the following grounds: Firstly, the Company M/s. Salvi Infrastructure Pvt. Ltd. was not made the accused and instead the respondent was made accused in his personal capacity; Secondly, the cheque could not be said to have been issued for the discharge of whole or part of the liability because it exceeded the liability; and thirdly, it had not been proved that the respondent was a person liable to make the payment for M/s. Salvi Infrastructure Pvt. Ltd.
Aggrieved by the dismissal of his application for leave to appeal by the Bombay High Court, the complainant preferred an appeal, by special leave, before the Apex Court. The Counsel for the complainant contended that under Section 138 of the NI Act, it is the drawer of the cheque who is made punishable for offence under Section 138 of the NI Act; that the Courts below have failed to appreciate that in the present matter the cheque in question was drawn by the respondent and not by the Company of which the respondent is the Managing Director-the cheque being drawn by him in his personal capacity on an account maintained by him with his Banker; and that the Courts below have wrongly concluded that notices under Section 138(b) of the N.I. Act were sent to all the Directors of the Company since such a conclusion was not supported by any evidence inasmuch as there was only one acknowledgment card on record, showing receipt of notice under Section 138(b) of the Act, by the respondent. The complainant also contended that the Courts below did not appreciate that the accused respondent in his statement under Section 313 Cr.P.C. had admitted that he was paid Rs.74,200/- as earnest money and that he had issued receipt for the same and thus there is no substance in the argument of the respondent that the cheque for Rs.74,200/- cannot be said to have been issued for discharge of whole or part of liability, because it exceeded the liability. The plea taken by the respondent in the Court of Metropolitan Magistrate, 33rd Court, Ballard Pier, Mumbai, was that the Company had not been made an accused in the case. As per Section 141 of the NI Act, if the person committing an offence under Section 138 is a Company, every person who, at the time the offence was committed, was incharge of, and was responsible to the Company for the conduct of business of the Company as well the Company, shall be liable. In the complaint and the affidavit, M/s. Salvi Infrastructure Pvt. Ltd. was not made the accused. Further, it was argued that there was no averment that the accused was the person incharge of, and responsible for the affairs of the Company. In that case the accused was mentioned as the said person incharge. In the present case, the accused Vijay Salvi was made accused in his personal capacity. The Bench accordingly relying on P.J. Agro Tech Limited and Ors. Vs. Water Base Limited [(2010) 12 SCC 146] held that the respondent can be made liable under Section 138 of the NI Act, even though the Company had not been named in the notice or the complaint. There was no necessity for the appellant to prove that the said respondent was in charge of the affairs of the company, by virtue of the position he held. The Bench, rejecting the contention of the accused said that as the respondent was the Managing Director of M/s. Salvi Infrastructure Pvt. Ltd. and sole proprietor of M/s. Salvi Builders and Developers, there is no need of specific averment on the point. “From a bare reading of Section 138 of the NI Act, the following essentials have to be met for attracting a liability under the Section. 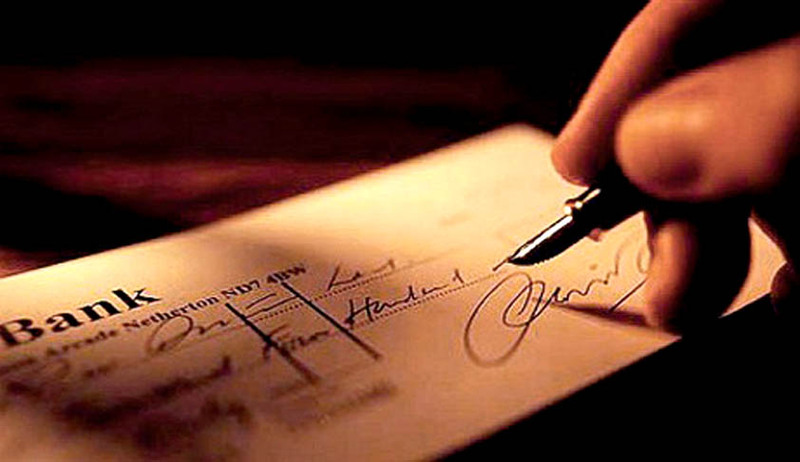 The first and foremost being that the person who is to be made liable should be the drawer of the cheque and should have drawn the cheque on an account maintained by him with a Banker for payment of any amount of money to another person from out of that account for discharge in whole or part, of any debt or other liability. We see that from the bare text of the Section it has been stated clearly that the person, who draws a cheque on an account maintained by him, for paying the payee, alone attracts liability, “ ruled the Bench while holding the accused guilty of the offence under Section 138 of the NI Act. Allowing the appeal, the Supreme Court awarded compensation to the extent of twice the cheque amount and simple interest thereon at 9% per annum to the complainant, and accordingly sentenced the respondent Vijay D Salvi to undergo simple imprisonment for a period of five months for the offence under Section 138 of the NI Act. The Court directed the respondent Vijay D Salvi to pay a compensation of Rs.1,48,400/- with simple interest thereon at 9% per annum, to the complainant-appellant, and in default of payment of the said compensation to undergo simple imprisonment for a period of six months.